Coming close on the heels of recruitment notification for 1500 clerks by IOB (Indian Overseas Bank) yesterday, Indian Bank has too published Clerk Recruitment Notification 2012 through IBPS for 1201 Clerks. As per the notification, the submission of online application form for Indian Bank Clerical Recruitment 2012 has started from yesterday (i.e. 29th June, 2012) and the last date of online registration/submission of form is 13th July 2012. You can also click here to find the Indian Bank Clerk Recruitment 2012 notification/advertisement. 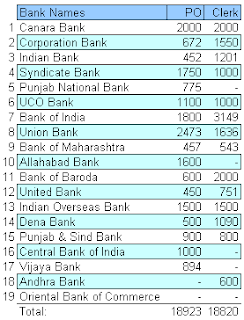 Total number of bank clerk vacancies through IBPS CWE 2011 now stands as 18,820. This is the 14th Clerical recruitment projects by the Indian PSU banks. Only following five banks (out of the nineteen PSU banks which had participated in IBPS CWE 2011 Clerk) are yet to issue recruitment notification/advertisements: Punjab National Bank, Allahabad Bank, Central Bank of India, Vijaya Bank, Oriental Bank of Commerce. This blog post summarizes the Indian Bank Clerk Recruitment Notification 2012 by quoting the eligibility as well as telling you how to apply online. It also tells you how to prepare for Indian Bank Clerk Interview towards the end of this article. Age Eligibility (as on 01.08.2011): Min 20 yrs, Max 28 yrs. (Relaxations exists as per Govt rule). Min. 50% marks in Class-XII/equivalent/Diploma in Banking from a recognized Board/University and same should have been acquired (i.e. 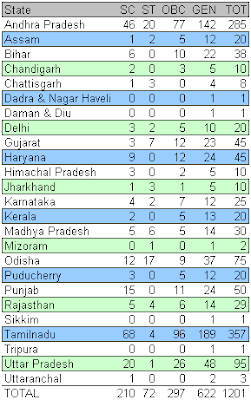 results declared) on or before 01.08.2011. 4.0 Computer Literacy – You should be computer literate or should acquire computer literacy within six months of joining the Bank. In addition, you should possess the minimum Total Weighted Standard Score (TWSS) as given in the table at left - state-wise, category-wise. Based on the CWE scores of the applicants received by Indian Bank, it is going to shortlist the candidates for personal interview. Final merit list for Indian Bank Clerk Recruitment would be prepared based on IBPS CWE mark & Interview. You would be sent your call letter for Indian Bank Clerk Interview in the e-mail specified during form submission. You should also check this Indian Bank career/recruitment webpage for updates. You can apply for Indian Bank Clerk Recruitment 2012 only online, There is no offline form. Click here for Indian Bank Clerk Recruitment 2012 Online Form. The online form would be available from 29th June to 14th July, 2012. 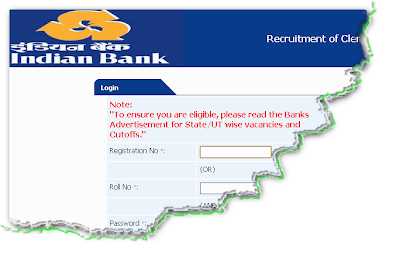 Click here to find how to fill the Online Form for Indian Bank Clerk Recruitment 2012. This blog has excellent materials to help you prepare for the Indian Bank Clerk Interview with a list of Interview questions. For Interview, click here to visit this article, which tells you what are the requirements an interviewer looks for in you. It also gives you an interesting You Tube video telling you how you can also analyze an interviewer and hence be prepared for it. And than it gives you a list of 99 interview questions, which are most repeated in every other interview! These questions helps you prepare yourself. In addition since how much you know about Indian Bank would almost inevitably be asked, you should go through this About us page of Indian Bank. Following are the traits which generally checked in Bank Clerk Interview: Attitude, Personality, level of communication, clarity and problem solving innovativeness, knowledge /proficiency in local/State language (ability to read, write and speak local/State language) level of effectiveness in computer operations, willingness to work anywhere in the State. Hope with above information on Indian Bank Clerk recruitment you can not only apply with ease but also get that coveted Indian Bank job easily. You should also visit this Indian Bank Career/Recruitment webpage for subsequent updates like for downloading call letter/admit card, result etc. I would post dedicated blog article as and when the remaining five banks (i.e. Punjab National Bank, Allahabad Bank, Central Bank of India, Vijaya Bank, Oriental Bank of Commerce) issues recruitment notification for clerks. So please keep visiting this blog!